I heard about it while watching Oprah (my mom called me from my room to see) and I understand why she did :) I have done many of the processes that he talks about in the movie (or at least from what I can see in the trailer). Some of which are really damaging to your hair and scalp (degrees of which depend on your hair type). So, for those of you who don't know much about how people with curly hair style their hair...here's a bit of info. What follows is the explanations for some of them. RELAXERS: a creamy product used to permanently straight your hair; its active ingredient is usually a strong alkali (like Sodium Hydroxide, pH of about 10-14). Sometimes a weaker alkali is used, such as Ammonium Thyoglicolate (I think a pH of 8-9). The natural pH of your hair is about 4.5-5.5, which means it's slightly acidic. So, the base a relaxer penetrates the cortex layer of your hair and breaks the bonds that give your hair is curly pattern. The relaxer stays on your hair for a certain amount of time (usually 20 minutes from the time of application), then it is rinsed and neutralized. There is also something called a texturizer, which is a weakened version of a relaxer. So it just loosens your curls rather than straighten them completely. But, I think it contains the same basic ingredients. 1) People often leave the relaxer on for longer than 20 minutes (i.e. after all of it has been applied, then they count 20 minutes). This can result in chemical burns (it's very important to protect your scalp as much as possible when doing a relaxer, especially with a more alkaline relaxer). In fact, relaxers can generally lead to hair loss due to the application of such harsh chemicals. 2)Improper care of your hair after relaxing: As your hair is a weakened state (its bond have been broken), you have to continuously maintain it by always moisturizing and applying deep conditioning treatments. You also can't tie your hair too tightly as it will promote breakage of your hair. Without proper care, your hair will dry out and break. Hair breakage happens especially at the temples and around the nape area of the neck (at least in my experience - though it can be generally widespread). In fact, hair breakage often occurs at the junction between your relaxed hair and new growth because the textures are so different. You try to detangle your natural hair and then reach the bone straight hair, and snap. That usually means you need a touch up on your new growth. 4) Your hair texture might not be suitable for relaxing: This is my case. My mom's hair is fine and wavy. My dad's hair is coarse and very tightly curled. My brother got coarse + big curls. I got fine + very tightly curled hair. So, after trying relaxers of various strengths a number of times , I've determined they never work for me. My hair breaks without fail, despite my attempts to properly maintain it. 5) Relaxers stink: When you're having the process done, dude man, it stinks...like 100 stink bombs. That's probably enough to deter me from doing it again, too. Also, by the way, if you want to go back to your natural hair after relaxing...you have to grow it all back again :P Which means, grow out the relaxer and chop off the straight stuff (or just let your hair progressively break off...which is what usually happens to me. Except the first time, my mom chopped it off...not so cool for an 8 year old to have 2-3 inches of strangely styled hair). Other ways to straighten curly hair: Blow dry + flat iron. The problem with doing this on a regular basis is that after a while, your hair will eventually either i) lose it's ability to curl in the same way ii) have general heat damage, leading to extreme dryness and breakage. 1) Braiding: Braided extensions can be a great way to add length and color to your hair without the need for any chemicals. The stylist will basically add pieces of hair (whether fake or human) by braiding it with your own hair. You can have either single braids or cornrows (or combo of the two). I've had both done and generally liked them. i) You can't exactly wash your hair properly. Washing your scalp is entirely possible. But your hair is trapped in more hair and it's hard to completely wash. Though, i've had better experience washing hair with cornrows. ii) Traction alopecia: more hair loss! The reason is that when you add extensions to your hair, especially if the stylist braids tightly, stress is applied to your scalp. Over time, with continual use of braided extension styles, your hair starts to thin in that area. I'm trying to remedy that problem! In this process, the stylist cornrows your hair either in concentric circles or just in horizontal or vertical rows, then sews on tracks of hair (either fake or human - human looks nicer and lasts longer/has less of a tendency to tangle). You can either have a full weave (covering your entire head) or a partial one while integrating parts of your own hair (usually the front). So, here you can have wavy, straight, super curly hair. Whatever you like and it's not braided. i) The hair washing thing again. Though this time, you have an even harder time accessing your scalp since it's all covered by hair. It also take a while to dry. 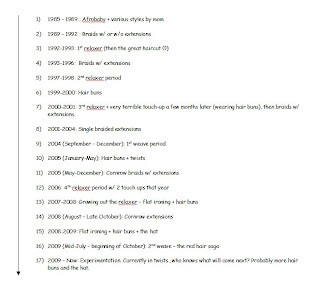 ii) Hair loss! : the first time I had a weave done was in fall 2004, by the suggestion if a stylist after she noticed I had some thinning in the front due to doing single braids many times. She said it would give my hair a break. My initial impression of weaves was not so great - I felt that it made me look strange, as if I were wearing a helmet and then hair attached on top of it. But anyways, at the time, it did help my hair - I noticed less thinning following that style. My latest weave style was noticeably less helmetty (done by a different lady) but, I've experienced more thinning - which is rather upsetting :( So weaves = hair loss too. There are a number of other natural styles people can do, like twists, afros, dreadlocks (though be careful with stress too...kind of like the single braids). You can also add clip on hair pieces to your hair. Through all my hair experiments, I've definitely had regrets (that last relaxer in 2005-06 shouldn't have been done :P), but I've learned something from each of them. I would like to try to work with my own hair (so as to minimize hair and scalp damage), but I've found it hard to find something that's relatively simple to do and that looks nice. So the quest continues. interesting. the movie opens at the amc on friday oct 16. we should go! I wasn't sure which day it was opening. Where did you find the listing? (when I checked cinemamontreal I didn't find anything). there was an ad in this week's 'hour'. I actually saw the movie last week and learned a lot. I didn't realize that so much effort (not to mention money) goes into getting hair to look like that. If you haven't seen it yet, I definitely recommend it. I think it's still playing at the AMC. Yeah, I saw the movie the day it came out. I'm glad you enjoyed it.